Visit Ramsey Outdoor online at RamseyOutdoor.com for all your outdoor specialty needs. Ramsey Outdoor has catered to the needs of outdoor connoisseurs for the past fifty-five years. Located in Northern New Jersey, Ramsey specializes in fishing, camping, water sports, climbing, backpacking, hiking, hunting and the clothing and footwear needed to maximize your adventures in the great outdoors. Some of the brands carried by Ramsey Outdoor are; Bimini Bay, Gordini, Smartwool, Carhartt, Merrell, Teva, Cascade Designs, Outdoor Research, The North Face, Patagonia and many more. Save on your next purchase from RamseyOutdoor.com with Ramsey Outdoor discounts, Ramsey Outdoor coupons, Ramsey Outdoor promotions and Ramsey Outdoor savings from 58coupons.com. Enjoy free shipping from Ramsey Outdoor on orders over $74 or more. Click link to start shopping. RamseyOutdoor.com is selling select Patagonia items at up to 25% off. Quantities are limited. Rush on over to Ramsey Outdoor to save up to 30% on Aquasocks for the entire family. Supplies are limited. Click link to start shopping. 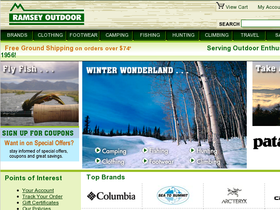 Head on over to RamseyOutdoor.com to save up to 20% on womens footwear. Hurry, quantities are limited. Click link to shop.